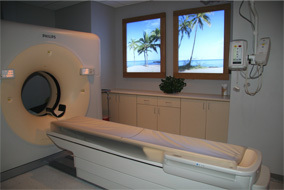 Rye Radiology Associates has a 16-slice Helical Brilliance CT (Computerized Tomography). This new CT offers advanced technology for increased speed, lower dose and diagnostic precision. CT angiography of the pulmonary, brain, neck, aorta, mesenteric, carotid and renal arteries. Sinuses, including STEALTH imaging for surgical planning. 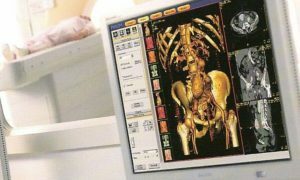 Routine studies such as abdomen, pelvis, chest and spine CT’s. During a CT scan, as you are laying still, a high-speed rotating ring made up of x-ray detectors and an x-ray tube rotates around the part of the body that the radiologist is studying. As the ring revolves around the patient, a narrow slice of the body is imaged from hundreds of angles. The ring is then incrementally moved and the next slice is x-rayed. The cross sectional images that are recorded are so thin that they provide incredible detail for the radiologist; far greater detail than a conventional x-ray. CT is used to diagnose a variety of diseases as internal organs, bones, soft tissue and blood vessels can be seen with such clarity. For some studies, the images are all taken and then the CT computer combines all of the images to create a 3-D image of the part of the body being studied. CT studies are fast and non-invasive. CT’s provide accurate detection of abnormalities such as pneumonia, benign and malignant tumors, sinusitis, pancreatitis, bladder and kidney stones. Prior to your exam be sure to share with us the medications that you are taking as well as any known allergies. Also, please be sure to inform us of any medical conditions you may have for example, kidney disease or a heart condition. Oral contrast, such as barium is used to enhance the gastrointestinal (GI) tract in the abdomen and pelvis. For some exams an intravenous contrast material is used which highlights blood vessels and increases visualization of the structure of organs like the brain, liver and kidney. If your study requires intravenous contrast material, you will be injected with the contrast material through a vein in your arm. If you have a known allergy, we may give you medication prior to your appointment to reduce the risk of an allergic reaction to the CT contrast. Depending on your exam our staff will review any necessary preparations. In some cases we may ask that you not eat or drink anything for a few hours prior. Depending on the type of exam that you are having you may be asked to change into a gown. Jewelry or any metal objects may be left at home. A locker will be provided for any personal items such as eyeglasses and clothing that may have to be removed for the exam.